Race Takeaway: Hills zap me, but at least I’m out moving. 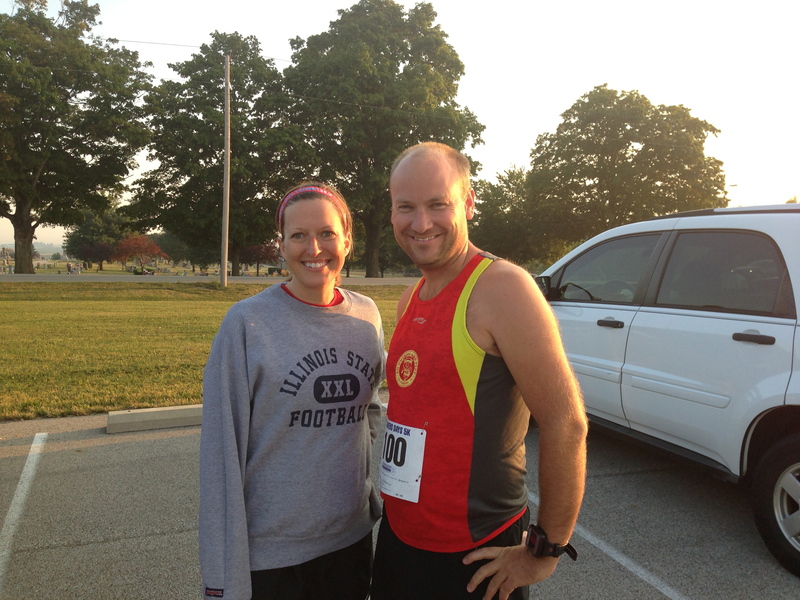 This morning was the Heart House 2 Mile Walk / 4 Mile Race/ and 10K Race in Eureka, IL. It was low 50s, sunny, but breezy. 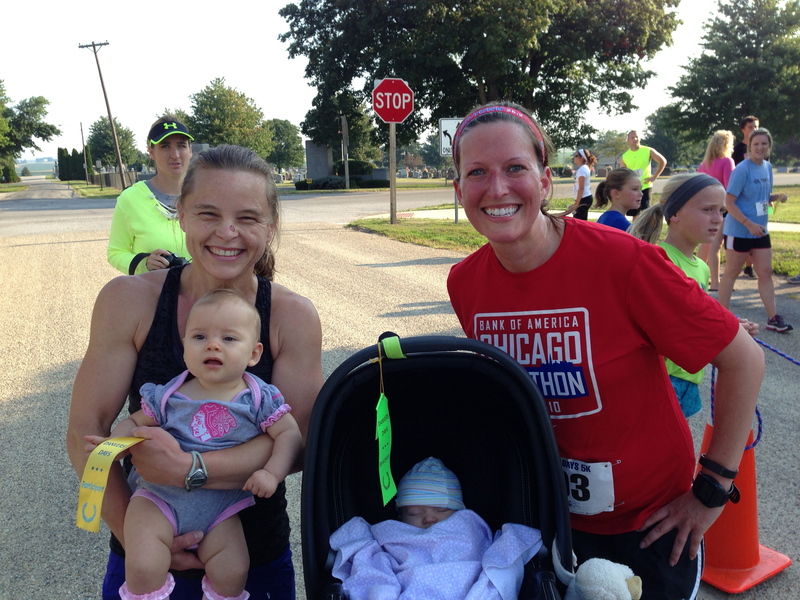 Racing with a baby has changed my approach to race morning. Before Chase I would make sure we were up and hustling to get ready so that we would get to the race with more than enough time. I would stress if we aren’t at a race at least an hour ahead. I want to know that we have enough time to park, register or pick up our packet, get extra warm up clothes off, bibs on, and a warm up with time to spare. Now that’s all changed. Rob and I still move with focus and hustle in the morning, but the X factor is how is Chase feeling. And Rob and I are both okay with whatever happens. In the case of this morning Chase was extra hungry and took her time eating. 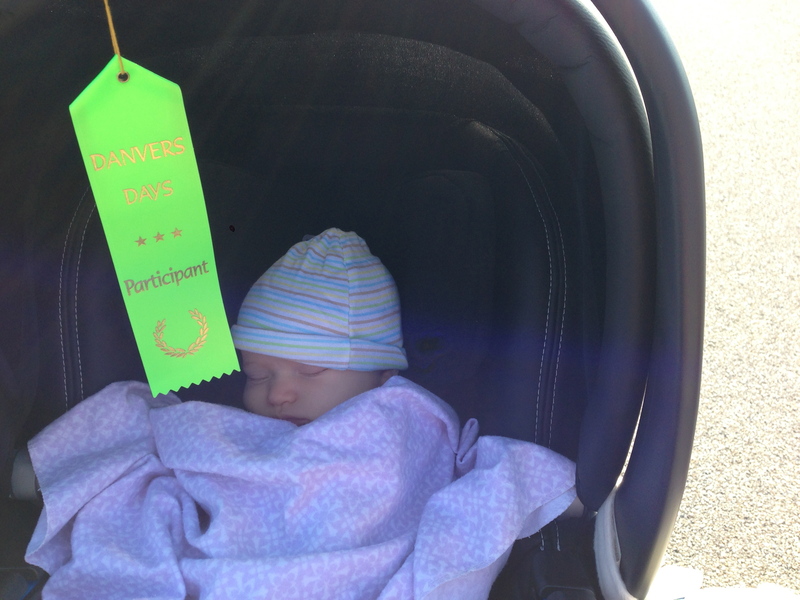 Plus she pooped three times (it happens), which meant lots of changes before getting her all bundled up for the race. We weren’t stressed at all. 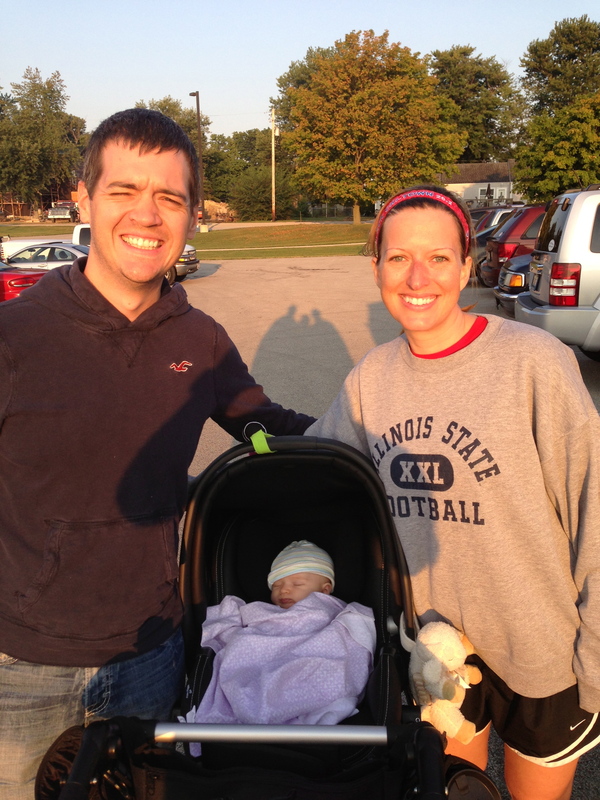 We were like “hey if she doesn’t seem happy we won’t go”, and she was a totally happy baby. And when we got out the door very late, we figured “hey maybe we will just have a nice drive and go out for a run somewhere”. Turns out we made it there with about 15 minutes, which was just enough time to get ourselves registered and Chase ready. 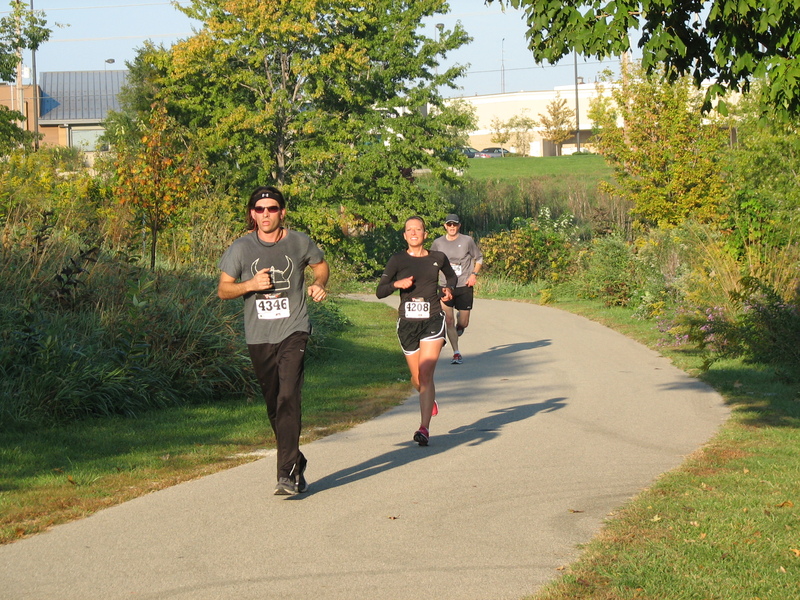 We decided this race Rob would still push Chase and we would each run our own pace. Rob would take it easy on any turns or bumpy road conditions. Rob and Chase finished in 52:30 and I was done at 58:20. I nursed Chase afterward in the back of the car and Rob went to check the results. This was a very small field so Rob and I both got 2nd in our Age Groups. Us with our finisher medals and Chase. Chase was ready to go and we headed out. Categories: 10K, 3-6M, Award, Baby, Hills, Race | Permalink. 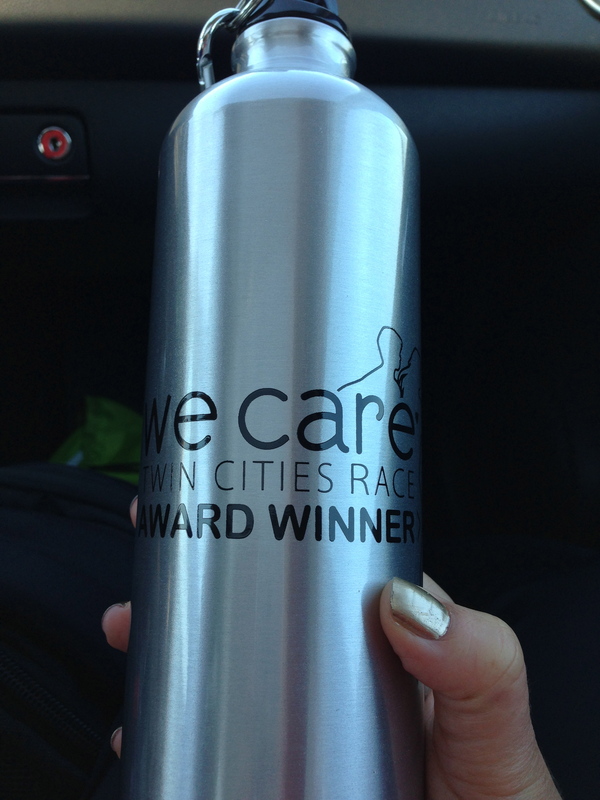 Race Takeaway: Even pacing feels so good! I hope you all had a great Thanksgiving, filled with time with family, friends and good food! We enjoyed having family over and cooking for everyone. 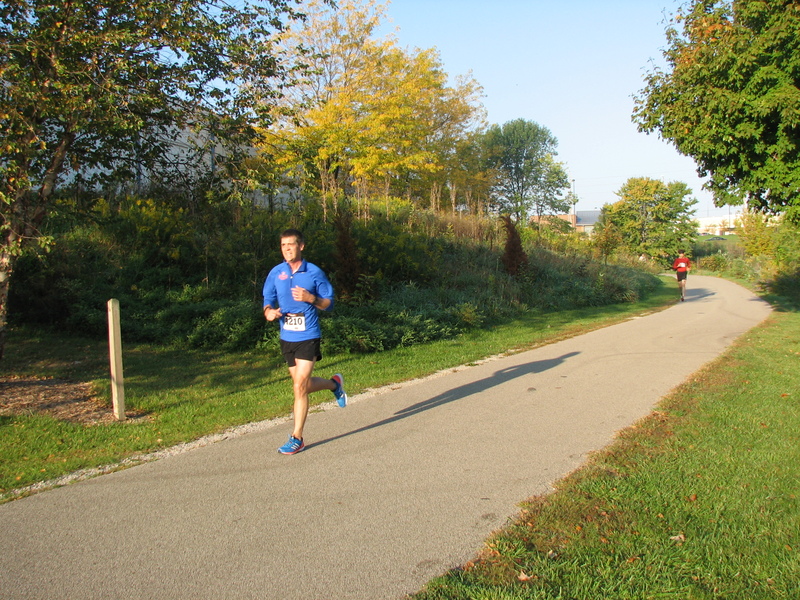 Saturday (11/24), we went to Peoria, IL to run the Festival of Lights River Trail Classic 4M race. This race is a point to point race on the trail system (a paved road, not trail as in a path in a forest) that has a down grade the whole way. It’s normally a great race to set a new 4M PR, but with being pregnant I would be running to get in a good workout and Rob would be with me. We did a 2.15 warm up with our friend Mike. I’m glad we got out in the cold temps to warm up so it was less shocking by race time. It was cold, upper 20s and a chilly breeze was in our face the entire time. Rob and I haven’t been good at gauging where I should start at and we once again were too far back (about 15 people deep) and had to pass people the first half mile to get into a pacing area that felt good. Miles passed quickly and all of my splits were 7:3x. 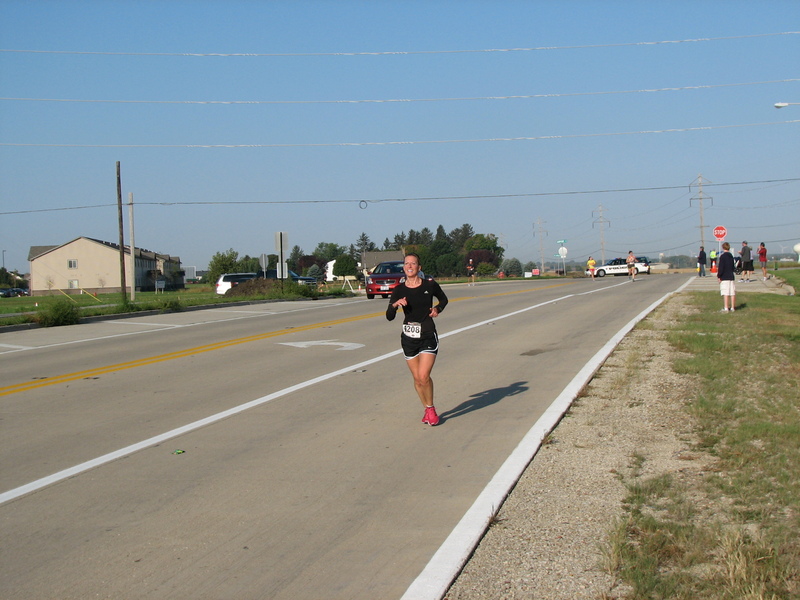 I was very happy that I knew I was working and able to keep the effort even for all four miles. It’s hard to know right now if a pace is sustainable for multiple miles and each day is different. I was even able to speed up on the last push to the finish and we were done in 30:16. After talking with our friends we didn’t stick around for give aways or awards. I was certain my time wasn’t award worthy, but I was wrong. 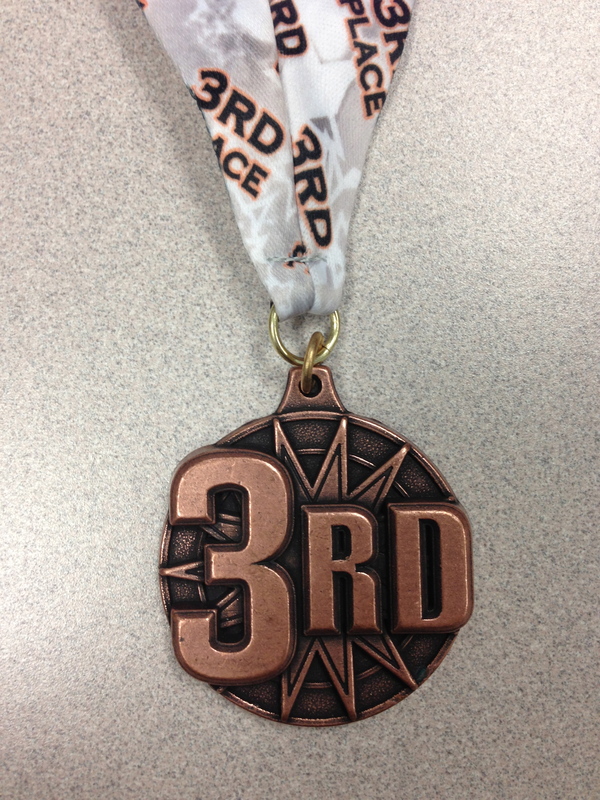 I ended up 3rd in my Age Group out of 37 and our friend Senthil picked up my medal for me. 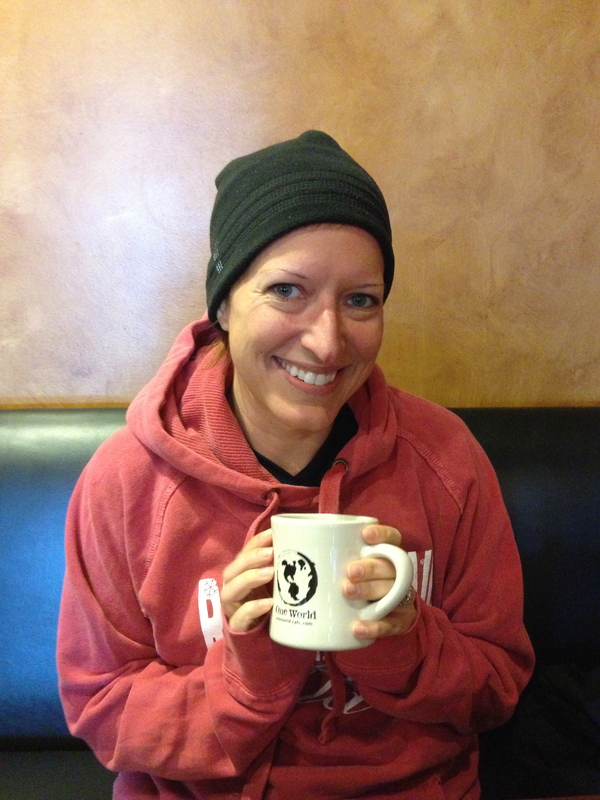 Meanwhile Rob and I bundled up in clean, warm clothes and headed over to one of our favorite breakfast places, One World. Me with my decaf coffee trying to get warm. 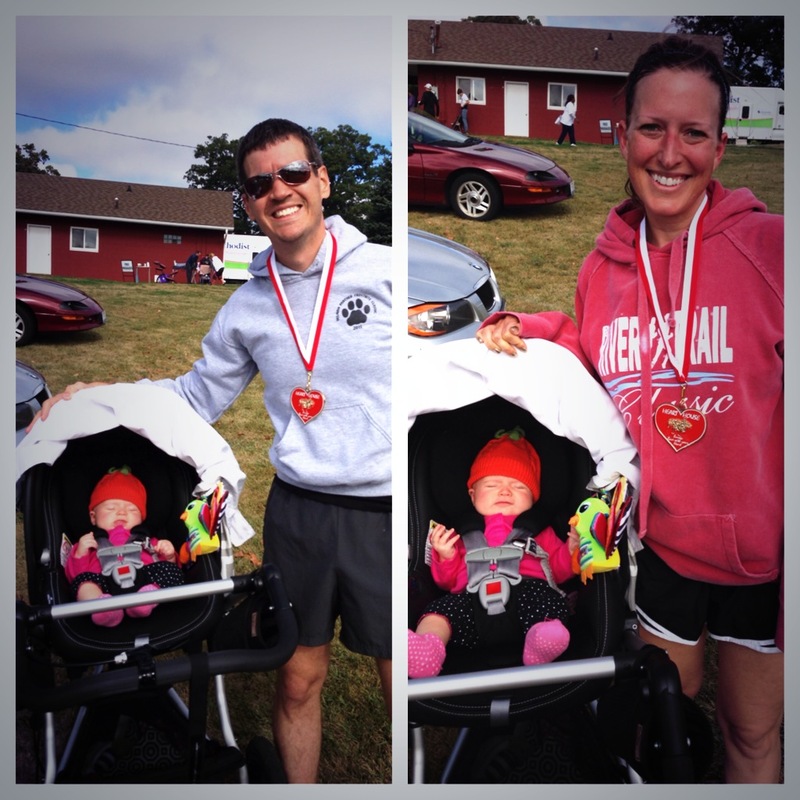 Categories: 4 Mile, Award, Pregnant, Race | Permalink. Race Takeaway: I love our town! 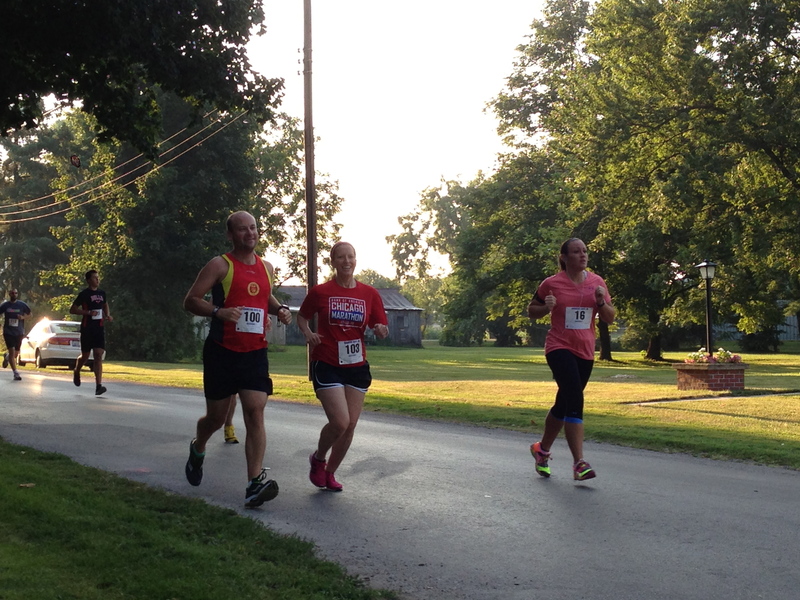 This morning we were up at 4:45am to run an inaugural half marathon that was hosted locally. 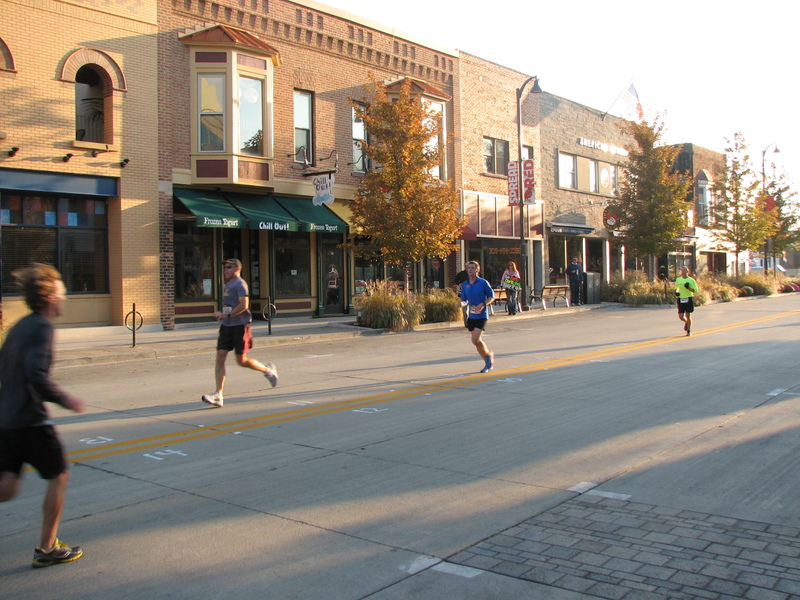 I’m SO excited we did this race because not only did we have perfect weather in the 50s, but it was great seeing so much of the community out being healthy. 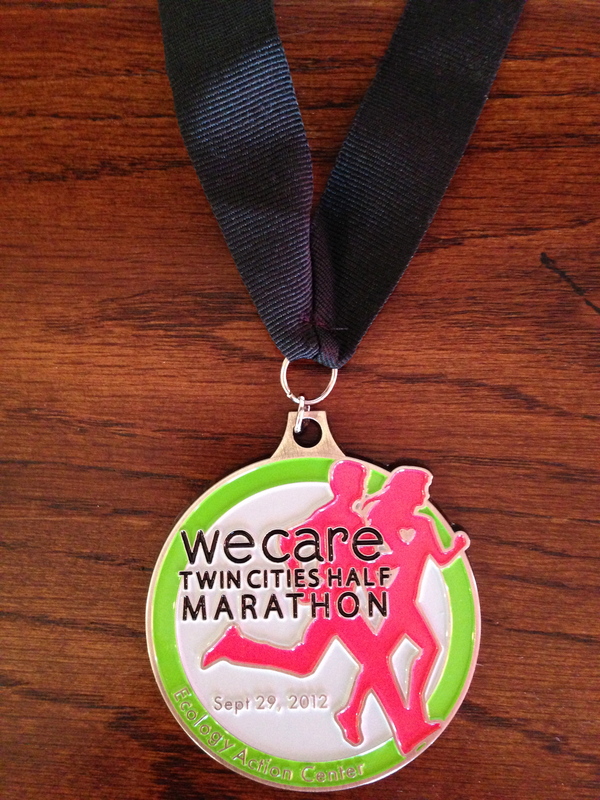 My plan for this race was to run my marathon pace or better, but not full out race. 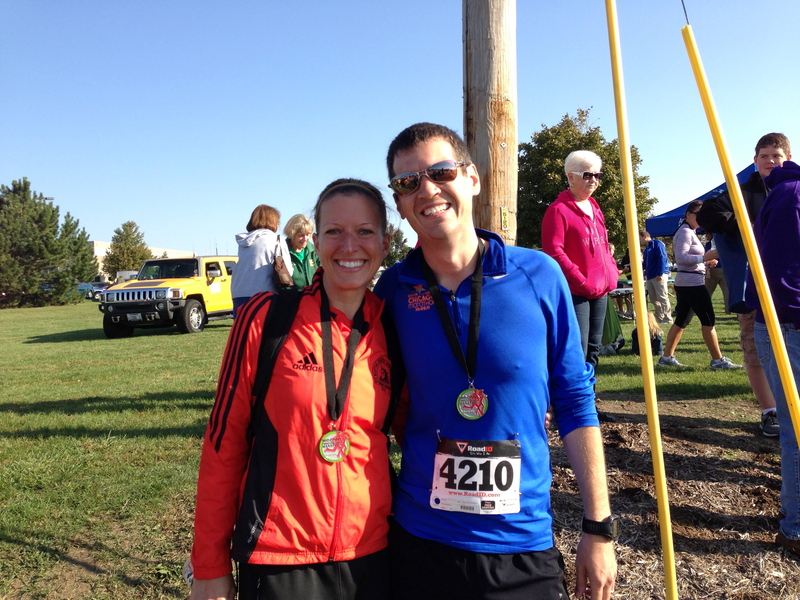 We are running Chicago Marathon next weekend and we need to make sure that we have energy in the tank for it. Both my legs and stomach were feeling amazing and it was hard to not get swept away and run too hard. 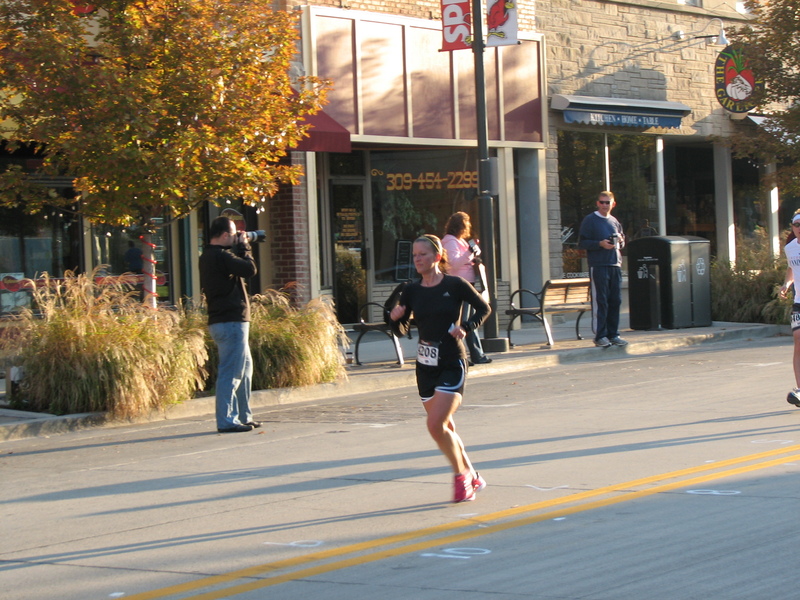 I was able to have moments of chilling out by waving and talking to the crowd and other runners. So many people we know from work, running and flying were all out. 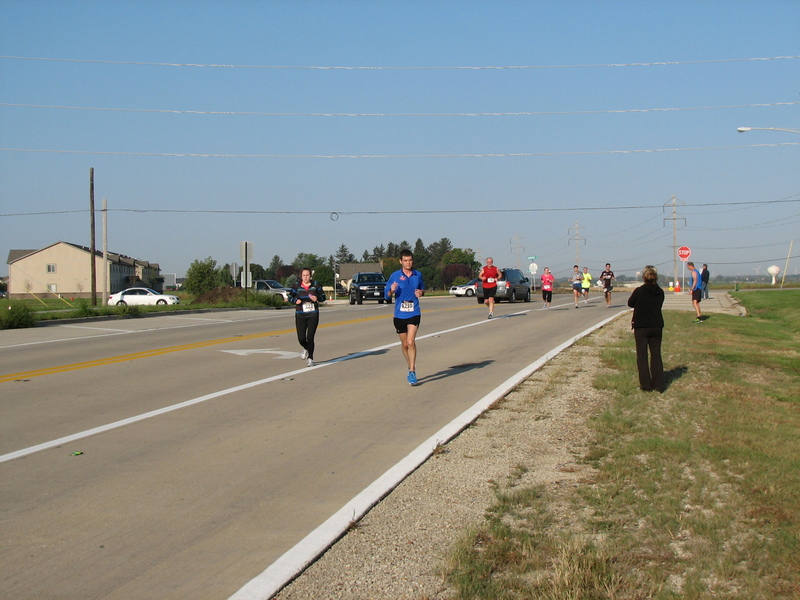 The race was mostly flat and only inclines on the road heading back to the finish. 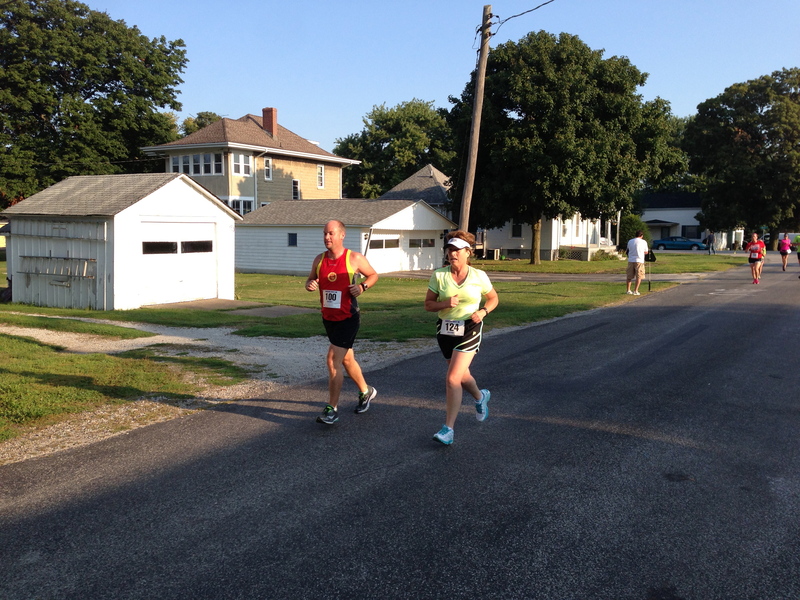 It was an out and back course that allowed us to see other runners the whole way and encouraging them. I spent a few miles running in the vicinity with the race director and got to hear about the work that went into this event and their plans for next year, which include adding a full marathon. I came in at 1:41:49, 1st in my Age Group. Rob got 1:34:26, which was 4th in his Age Group. I’m so happy that we got to run this race and we plan to run it again! Categories: Award, Half Marathon, Race | Permalink.